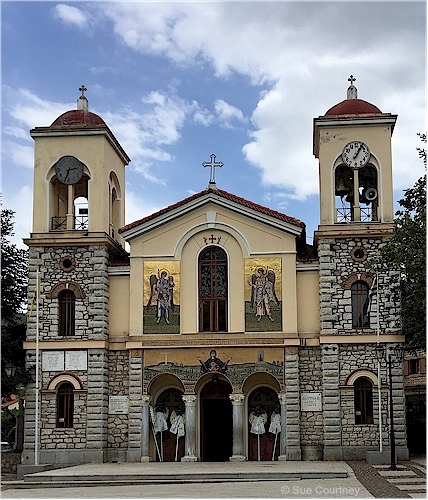 The mountains tower over Diakopto and rise steeply inland to the resort village of Kalavryta that serves the Kalavryta Ski Resort on the north west slopes of the 2,340 metre high Mt Helmos. Kalavryta is also infamous for German atrocities in WWII. The best way to get there from Diakopto is on the 120-year-old Odontotos Rack Railway now run as a tourist train by Trainose. This was something I’d been planning to do for months before my trip to Greece. Unlike the Katakolo-Pyrgos-Olympia tourist train that seems to only run when cruise ships come in, the Odontotos Rack Railway runs daily except on strike days like Easter Sunday yesterday. With six journeys cancelled there are crazy scenes at Diakopto Railway Station with hundreds of people milling around and queueing for tickets. My ticket is booked. I only have to pay for it. I have a seat on the train. We pull out of the station with holiday jubilation. Through the village and within minutes we are racking up into the limestone hills. Across the valley are corrugated iron goat sheds perched in impossible places and face-like etchings in the cliff face. Then into steep-sided travertine-like strata with almost vertical striations. The geology is amazing. There’s a river way down below in the crevice-like ravine the train is following plus tunnels, overhangs, viaducts and very green bush – it reminds me of places in South Island, New Zealand. The train squeals in pain on every corner. I lean out the window and see moss covered boulders in the tumbling mountain stream. We pass a sign announcing National Park, ‘Vouraikos’. Now there are flowers – wildflowers, yellow flowers like broom and another like my mother used to grow (the name escapees me). So many trees now. I recognise oaks but not many others. Beehives. Deserted buildings. Sentry posts. There are five Dutch ladies travelling together. I am in the window seat next to them. They stayed at Chris Paul Hotel last night, probably why we are sitting together. Yesterday they walked to Diakopto down the railway line. They must have been relieved to know the train was not running because in places there’s only room for the train to squeeze through. They tell me it is part of the Peloponnese Walkway. I bookmark the information. It is something I would like to come back and do. They get off at Mega Spileon, the halfway point, to retrieve their car. And soon we are more into open spaces, the stream bubbling alongside always on one side or the other. There’s not much more than mountain tracks for roads up here until the highway suddenly appears. Soon after we arrive in Kalavrtya. The train disgorges it passengers, myself amongst them. I wander through the town. 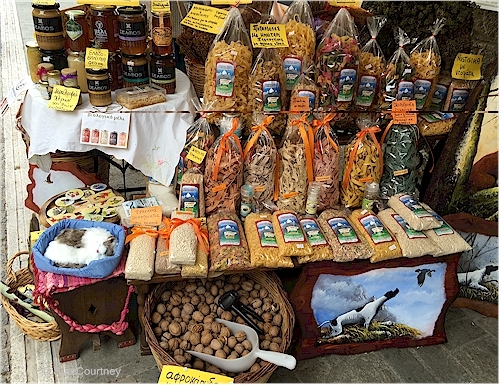 Quaint little shops – lots of shops selling dried herbs, pastas, pulses, cheeses, honey and oils. 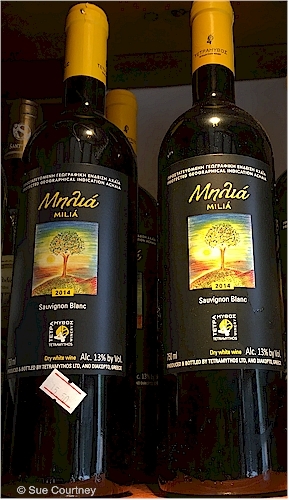 And sometimes local wine. Should have bought a bottle to see how their sauvignon blanc tastes to my Marlborough-honed palate. They make sauvingon blanc here !!! I stop at a ski shop – there are several here but only one open today. What country am I in again? There’s a holocaust museum I don’t go into. I eat my lunch across the square from the church. I wanted to go on a tour to the skifield. I wanted to go on a tour to a local winery. None are running today. It starts to rain and thunder roars. I take an earlier train than planned back to Diakopto. The downhill ride on the train is more obviously steep. The yellow flowers stand out in the grey sky amongst the wildflowers of all colours with white and purple mostly and an occasional red poppy waving hello. I pick up my bag from the hotel and grab a bite to eat at the little café across from the station. 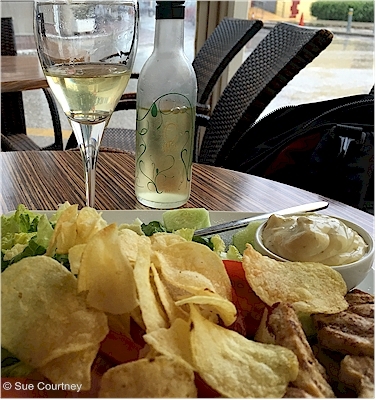 I order similar to last night, a sandwich without the bread – just chicken and salad and chips. But their version of chips is lost in translation. I get potato crisps. I wait at the railway station in shelter from the rain with others. The ‘train bus’ from Patras to Kiato is late but the suburban train at Kiato, destination the airport, waits for the connection. This modern train is smooth, quiet, fast and the route is scenic. In suburban Athens I change to a metro train to Larissa station. This is where I will be leaving from for my trip to Thessaloniki tomorrow. This morning I had booked a hotel just €30 a night, breakfast included. It’s a short walk from the station and better than expected for the price. It’s noisy. It is Athens after all. I put in my earplugs. I think I will have a good nights sleep. 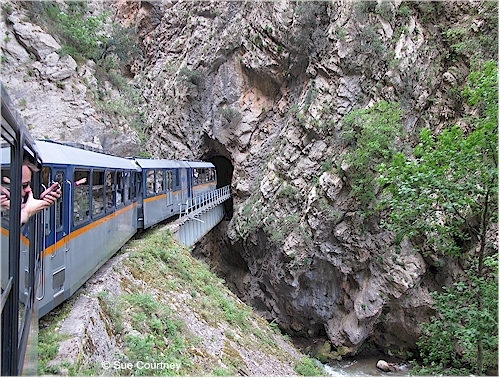 This entry was posted in Greece, Travel, wine and tagged Diakopto, Kalavryta, Odontotos, rack railway, train by Sue Courtney. Bookmark the permalink. How did you manage to prebook the tickets?